Trained at the Massage School of Santa Monica in Los Angeles, she has worked in both the United States and Europe. Evy is a long-time holistic practitioner. 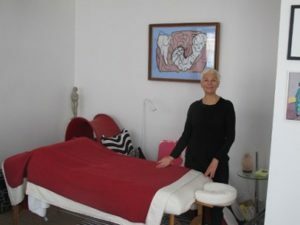 A graduate of the Massage School of Santa Monica in Los Angeles, she has worked in Los Angeles, New York, and Paris, and now has 20 years’ experience providing massage and life-coach services. She has a wide network of resources in the wellness community, and with her knowledge of alternative therapies, she is able to advise on selecting, preparing, and eating healthy foods. Evy can also help with exercise, fitness, and postural correction. What can you expect from a massage session? A session lasts a little over an hour. Clients are left alone to undress and lie down on a padded, heated massage table. To respect personal privacy and provide adequate warmth, the client is covered with a cotton sheet so that only the part of the body being worked on is exposed. Whether or not you talk during a session depends on you. Some clients need to talk; some need silence. Massage therapists will accommodate the client’s needs. However, talking can detract from entering into a state of relaxation or experiencing the physical or nonverbal dimensions of massage. In any case, feel comfortable to talk about your needs and what you like or do not like during the session. Good communication enhances the massage session. A good massage therapist uses only high-quality oil or lotion, but if you have a specific allergy you should tell the massage therapist. Music played during a massage session is soothing and unobtrusive. It is best not to have eaten just before a session. Your massage therapist can answer many other questions you may have. Please telephone for fastest response. Featured in « Les meilleurs massages de Paris » (éditions Parigramme) and « Beauté 500 adresses et bons plans à Paris, Edition 2010 » (éditions marie claire).